In Jericho, a man climbs a tree seeking Jesus, but who is seeking whom? St. Luke tells us that as Jesus was passing through Jericho, He encountered a man, Zaccheus, who was a “chief tax collector and also a wealthy man.” We know that religious Jews despised tax collectors for their traitorous work on behalf of the Roman government. Tax collectors often got rich through extortion, piling up dishonest gain for themselves. No wonder no one was willing to make way for Zaccheus as he eagerly sought “to see who Jesus was.” What did he know about the Lord to make him so determined not to miss a chance to see Him? At the very least, he must have heard that Jesus was a remarkable miracle-worker and maybe even more than that. Recall that when Jesus asked the disciples, “Who do men say that the Son of Man is?” (see Mt 16:13), there were all sorts of answers—Elijah, Jeremiah, or one of the prophets. Zaccheus wanted to see for himself the One who created all this buzz. When Jesus passed by, the little man got quite a shock: “Jesus looked up and said, ‘Zaccheus, come down quickly, for today I must stay at your house.’” Jesus knew him by name—already—and He wanted a face-to-face visit with him. Surely Zaccheus never expected this kind of miracle. Perhaps he hoped to see Jesus heal someone or drive out a demon. Instead, he discovered that Jesus knew him, saw his determination, and invited Himself for a visit. It’s a wonder Zaccheus didn’t fall out of that tree. He “came down quickly and received Him with joy.” For such an obvious sinner to be singled out for a visit by Jesus was beyond remarkable. Zaccheus could hardly wait for this encounter. This beautiful story reminds us of something religious people often forget. Jesus came to save sinners, not condemn them. The Church’s work of evangelism must constantly preserve this reality. Sinners need to hear something about Jesus that stirs up their curiosity, to hear the Good News of God’s love and desire for them first. When they understand this and step into its joyous truth, then they are ready to keep the “rules” of sanctity. They discover, in their conversion, that the “rules” are actually the path to happiness, but they cannot see this while they are still blinded by sin. They must first see Jesus; when they know He sees and loves them, they are ready for a change. 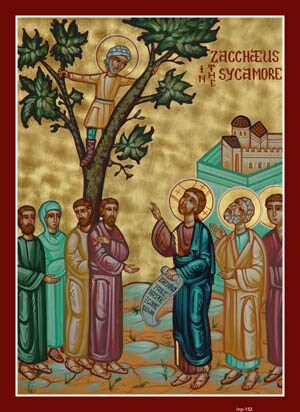 Zaccheus, after Jesus looked up at him in the tree and spoke his name, was happy to be generous with his wealth and to make amends for all his dishonesty. Yes, Jesus comes to “stay” with sinners, just as the crowd outside Zaccheus’ house grumbled, but the sinner is never the same. The lost has been found. Possible response: Lord Jesus, when I encounter an obvious sinner, my first reaction is to scold. Help me instead share Your love with sinners hungry for it. God is kind and gracious to sinners. Are we? Possible response: Heavenly Father, thank You for Your patience and love for us sinners. Help me be patient with my own weakness for sin and to keep working on repentance and faith. In this epistle, St. Paul writes to his Christian friends who had been converted through his preaching of the Gospel. See how he prays for these converts: “That our God may make you worthy of His calling … that the name of our Lord Jesus may be glorified in you … in accord with the grace of our God and Lord Jesus Christ.” What does this prayer mean? It recognizes that no convert is worthy of God’s kind forgiveness of sins. We are utterly dependent on God’s grace for this. However, when we do, in faith, respond to the gift of salvation He has made possible in Jesus, then He begins His work in us to make us worthy of such a calling. God loves us too much to leave us in our sin, because we were designed for goodness, God’s own goodness. So, conversion begins the work of transformation. We saw a wonderful example of this in Zaccheus. When he realized that he, the unworthy and despised sinner, was going to be visited by Jesus, his life was turned inside out. Jesus’ goodness to him made it possible for him to become good. This is precisely what St. Paul prayed for his Christian friends. It is what we still pray in the Rosary: “Pray for us, O Holy Mother of God, that we may be made worthy of the promises of Christ.” Our perfection by God, though we are sinners, glorifies the name of Jesus in us. What a gift! Possible response: Heavenly Father, it is a great mystery to me how You will make me worthy of Your calling, but I place my trust in You.